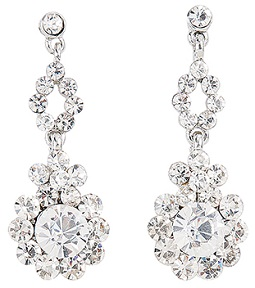 Below the rhinestone stud is a splendid rhinestone flower that dangles. At the center of the flower is a 1/4 inch rhinestone that is surrounded by smaller ones to form the petals. FWO Extra: This drop earring is pierced and measures 1 1/2 inches long. It is also light weight.